Lightmap has released HDR Light Studio 5: a major update to its real-time image-based lighting design tool designed to increase its appeal to visual effects professionals as well as visualisation artists. Speaking to CG Channel, Lightmap CEO Mark Segasby described the release as “the biggest we’ve ever done”, noting that many of the new features “are aimed at significantly more serious lighting artists than version 4”. HDR Light Studio enables artists to design their own synthetic HDRIs by dragging lights around on a rectangular latitude-longitude canvas. The resulting image-based lighting can be previewed in the viewport of the user’s 3D software. 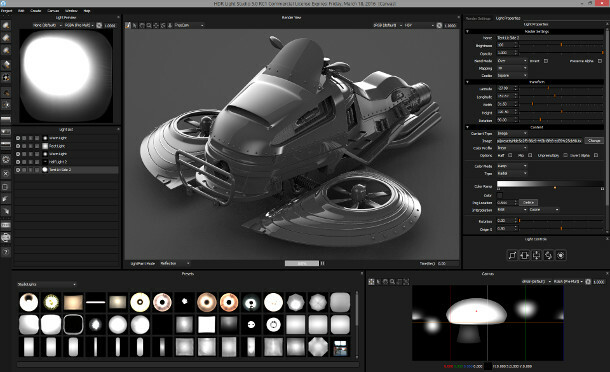 HDR Light Studio’s LightPaint feature also enables light sources to be positioned directly by clicking on the render view. Although in use at facilities like Pixar and MPC, the software’s core user previously centred around visualisation artists working on static 3D scenes containing reflective hard-surface objects like cars. That looks set to change in version 5, which adds “over 80 new features and enhancements”, many tailored specifically to visual effects pipelines. Although there’s no time slider in the initial release, meaning you won’t be able to scrub through animations manually, you can enter time settings numerically to change the view. In addition, HDR Light Studio 5 supports a number of other VFX industry standards, including OpenColorIO and OpenImageIO, and comes with Python and C++ APIs to facilitate pipeline integration. Less specific to visual effects, but equally importantly for performance, the software’s user interface and workflow have been overhauled. Whereas previous releases looked more like plugins, version 5.0 has a full-screen Qt-based interface with dockable panels that users can rearrange at will. The UI includes a new presets panel (bottom left of image), containing over 200 readymade lights that can be dragged and dropped onto a scene: controls for custom shapes will follow in a future release, apparently. The lighting canvas itself can also now also be scaled infinitely, rather than having a fixed resolution. In addition, users can import their own images – for example, flames or photographs of real-world light sources – to use as scene lights, including support for alpha channels. The software supports the .tx file format used in heavy-duty applications like Arnold, so performance should be good, even with large images: a 30K HDR can load in under a second, according to Segasby. The update also introduces new blending modes for images, including High Pass and Multiply; support for linear and radial gradients; and customisable 3D, planar and spherical mapping. In addition, Lightmap has introduced a new Lighting Preview Renderer based on Intel’s Embree set of CPU raytracing kernels. The scene itself remains fully interactive during process, while the software doesn’t need to start resampling from scratch if the lighting is updated during the preview. Other new features include a procedural sun and sky system, and a new Uber light type – a “flexible, multi-purpose light type with additional alpha controls”. HDR Light Studio’s ‘connections’ – the plugins linking it to host 3D apps – have also been updated. The 3ds Max and Maya connections now support LightPaint directly in the host viewport; and the Maya implementation supports the Redshift renderer, along with mental ray, V-Ray, Arnold, RenderMan and Octane. The Cinema 4D, LightWave and Modo connections have also been updated, with Houdini to follow shortly. The release also marks quite a shift in pricing for the software. The price of a perpetual node-locked licence rises from $499 to $995, while a floating licence costs $1,495. You also now have to buy your connections separately, rather than getting them for free. Most cost $145. Lightmap has also introduced new pay-as-you go subscriptions as an alternative to perpetual licences, with prices starting at $445/year – again, you have to pay for connections on top of that. As an incentive to subscribe, Lightmap is moving to a program of rolling development, with updates adding “significant new features” every couple of months. Perpetual licence holders only get 90 days of free updates. Discussing the price hike for perpetual licences, Segasby noted simply that the software is “much better now”. HDR Light Studio 5 is available now for 64-bit Windows, Linux and Mac OS X. The connection plugins work with 3ds Max 2013+, Cinema 4D R14+, LightWave 10+, Maya 2013+ and Modo 701+.